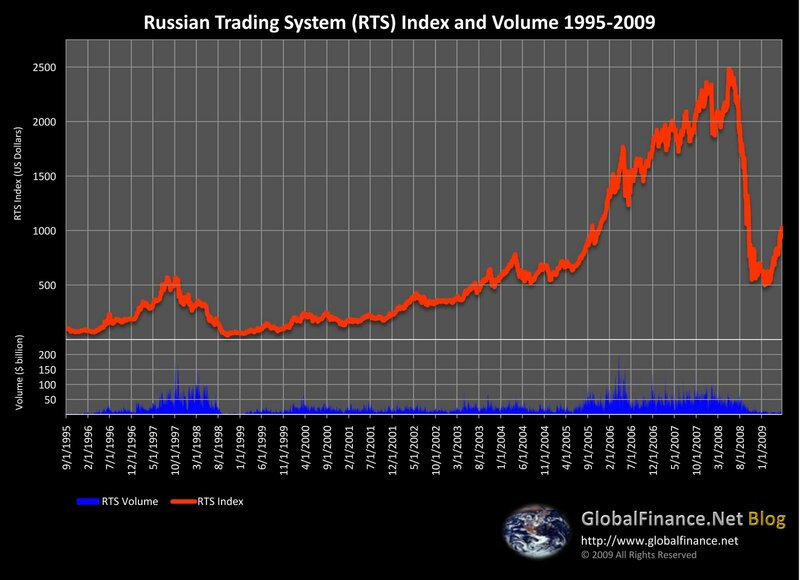 This is a chart of the Russian Trading System (RTS) Index from 1995 to the present. The chart is generated from data provided by RTS itself. The index includes 50 of Russia’s top stocks (LukOil and Gazprom account for 15% of the index, each). A list of the RTS index components can be found (in Russian) at http://www.rts.ru/s288. The index is a capitalization-weighted index, and is different from the price-weighted Dow Jones Industrial Average. Volume on our chart is a total of market trades, OTC trades as well as the futures and options market.